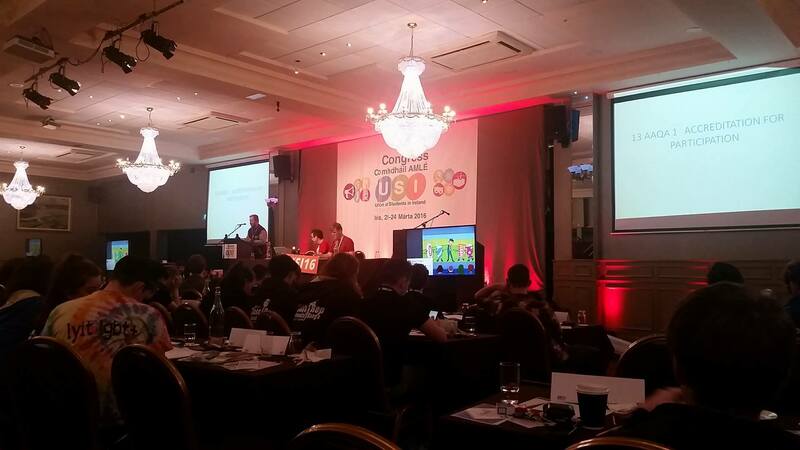 A gambling addiction awareness campaign was the most emotive topic on the agenda at the Union of Students’ Ireland (USI) National Congress this morning. Delegates took to the podium in a string of emotionally-charged pleas to implore the USI to take action against the problem of gambling addiction among students. The motion brought forward by the Blanchardstown Institute of Technology Students’ Union (SU), was passed unanimously after several speakers recounted their experiences with the problem. Jason Aughney for Blanchardstown IT received a standing ovation from congress for his speech on the matter. A range of motions such as drug testing kits, the accommodation crisis and water charges were widely debated during the Tuesday morning session. A slightly contentious motion to look into the feasibility of drug testing kits being introduced into colleges sparked debate among delegates. Katie Quinlan, Welfare Officer at UCC, said that “we need to try it…it could save lives”. Quinlan recounted the untimely death of a young person whom she knew at the hands of drugs. Other delegates expressed concern that taking drugs is “reckless behaviour” and that it would be a waste of money as students wouldn’t take the time to test drugs. The motion was carried with a majority. Congress voted to mandate the incoming USI VP for Welfare, in partnership with the Organs Donor’s Association, to distribute organ donor cards to all SU member offices by the end of April. The motion was brought by the Dublin Institute of Technology (DIT) SU and received a large majority of votes in favour. The USI’s mandate on accommodation was carried without dispute. It included proposals for the USI to establish a licensing agreement with landlords, to control rent levels and regulate digs. The USI also stated that they will work with national agencies such as Threshold and PRTB to combat the student housing crisis and offer more protection to students. The mandate also contained points on tax incentives for developers and tenant’s rights. Water charges were also debated at the student congress. The USI was called for student accommodation blocks to be exempt from water charges. “This motion shouldn’t be passed. It says water charges are fine, just don’t give them to students. It’s not collectivism and I don’t accept it,” said Ben Slimm, President for IT Tralee, asking for the motion not to be passed. Slimm reiterated that he is anti-water charges. A 9b was voted for meaning that the motion will be put to National Council. DCUSU put forward a motion to investigate the feasibility of introducing supports or stipends for student teachers in placement in primary schools. The motion was particularly relevant for DCU during the merger with St. Patrick’s College Drumcondra which has a large student teacher population. “We need to build on the success of the nurses’ campaign,”Sean Cassidy, DCUSU said. DCU SU Vice President for Education, James Donoghue, said an event he held for student nurses working abroad had the highest turnout of any event he put on this year. “Students have given up. Conditions shouldn’t put them off being teachers in Ireland, it should support and encourage them,” said Donoghue. The motion was carried by delegate’s votes. The Congress continues after lunch with debates on Union Development and Gaeilge.